Every type of Russia visa, excepting weekends and official holidats, should be registered at latest in 7 days according to laws of Russia Federation. If you stay at a hotel; hotel will register your visa during your stay no matter what kind of visa you have. In some hotels they can get very little registry fee.. If you don’t stay at a hotel and made an entry to Russia with TOURISTIC purpose; you will need to apply to local passport and registry department with the owner of house where you will stay. This rule is very complicated and frequent changeable. Do absolutely contact with us for the details of this complicated and frequently changeable registry rule. If the visa to Russia is for touristic purpose, your Russia visa duration will be at most 30 days, if you excess your Russia touristic visa duration which is 30 days, you can’t exit from Russia on the 31. day. If you left to 31. day for any reason, don’t ever try your chance like maybe I can go to airport and fly, according to law it is not possible to exit without taking Russia exit visa. Exit absolutely before the expiry date of your visa. Those that enter to Russia with every type of visa excepting Highly Qualified Specialist (HQS) = Высококвалифицированный специалист (BKC) visa, should be registered within 7 days. Contact with us about registry. Taking Russia exit Visa for those who came to Russia and completed 30 days without being registered and moreover left to 31. day, will be more difficult since they are not registered. Absolutely don’t neglect to be registered. If you don’t stay at a hotel and came to Russia with one of the COMMERCIAL, BUSINESS, TECHNICAL and WORK Visa, you should apply to company that invited you. Or you should go to local passport and registry department with your house owner and be registered. If you can’t apply to the company that invited you for any reason or can’t do this process with your house owner, another alternative ise to contact with us. Scanned copy of migration card, but it must definitely be seal on it in passport control which shows your entry date, if this seal is omitted, remind definitely to the responsible that it is not stamped in passport control. Important Note: Registry transaction can be made on survey that is filled by our part. The registered part of survey is torn and given. 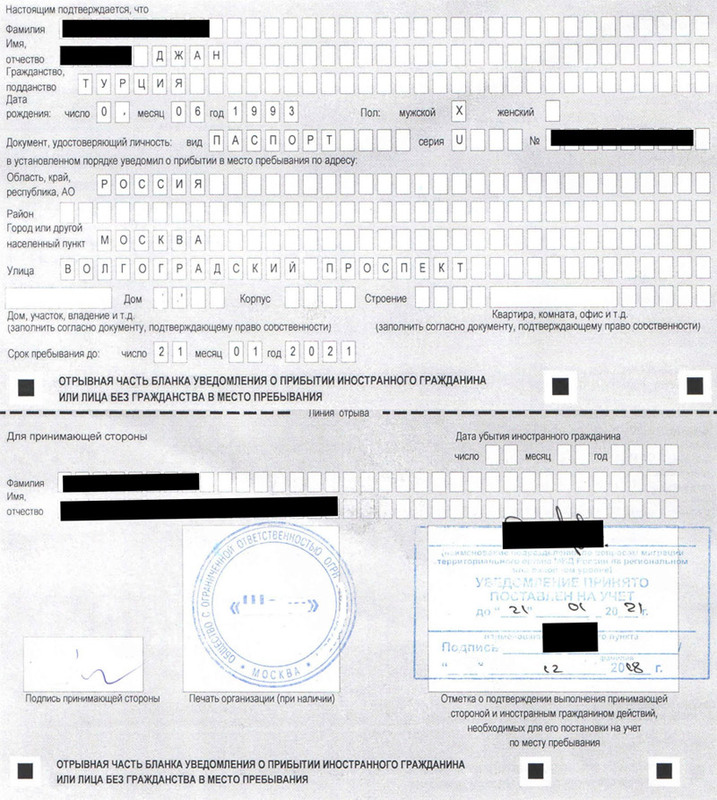 Registry process is repeated in your every coming to Russia. Those who are not registered, are responsible for penalties that may occur. These penalties are called as ADMINISTRATIVE PENALTIES. The entry to Russia of those that received this penalty, can be banned for between 3 and 5 years. Persons that are not registered can’t get some legal proves done, for example registry is asked in Notary, when buying car, when giving a power of attorney, when get married and in banking transactions.